I caught this in a presentation recently from Professor Dean Smeal of New Mexico State's Agricultural Science Center. 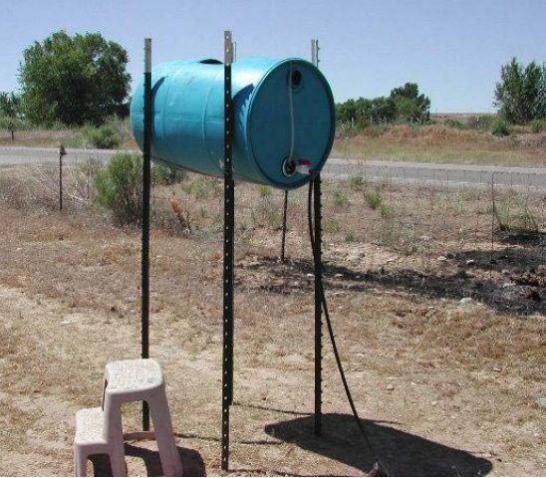 When I saw it, I was reminded of how important pressure can be to a rain barrel installation, especially if you are going to use it conjunction with drip. Most rain barrel stands get you a feet or two of height- enough for dispensing into a watering can or soaker hose. But for real deal gravity fed drip systems, more is usually needed. This system is one approach to getting a 55 gallon barrel 6 feet off the ground. As you can see, it is both simple and cost effective: just 4 tall fence posts connected width-wise with two multiloop lines of baling wire. Total cost is likely under $30. To use with a RainSaucer, one can install into the top bung cap by use of 2" male fitting, 2" elbow, two appropriately sized pieces of 2" pipe (to make the sure the RainSaucer clears the barrrel) and a 2" female fitting. To ensure the unit does not rotate in the wind, one can tighten and probably add some glue (although full disclosure: we've never tried this). The alternate and safer method is to install the RainSaucer at the very top with a 2" UniSeal, 6" section of 2" pipe, and a 2" female fitting. To get the water out of the barrel, one can use the 3/4" hole inside the bung cap on the bottom to install a faucet or ball valve, as shown in the picture.